Award-winning goat’s cheese and milk producer, Christo Venter, believes A-grade goat’s milk is needed to produce cheese of distinction. He told Gerhard Uys how veld-reared milk goats can supply the high-quality milk needed to achieve this. 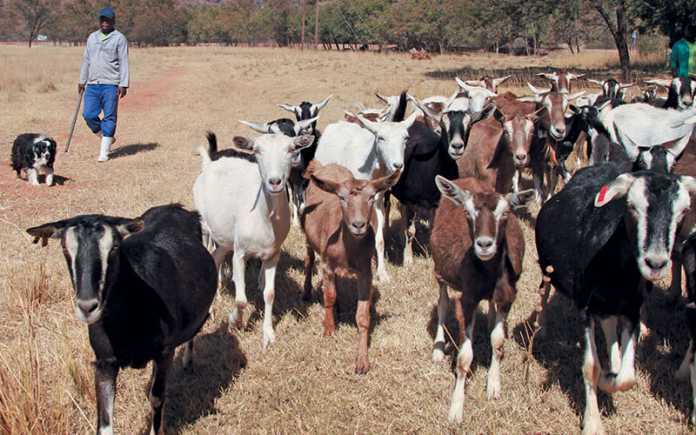 A desire to interact with animals led former game farmer and carpenter, Christo Venter of Vaalwater in Limpopo, to introduce milk goats to his farming operation. Today, he runs Geluksfontein Goat Cheese Farm, a milk goat farming operation that produces milk and cheese for a growing niche market. Christo bought his first 25 Saanen milk goats from a nearby farmer who had almost lost his entire 100-strong imported herd to heartwater. Christo needed milk for domestic consumption and was also faced with bush encroachment on his farm. He did not want to introduce cattle, as he feared that they would become infected with bovine malignant catarrhal fever (snotsiekte) from the blue wildebeest on his farm. “I bought the first goats for R268 each. 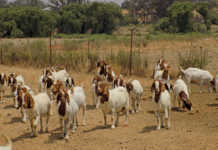 They now sell for around R2 500 to R3 000,” he says, adding that he never thought this decision would result in his current milk goat production operation. Christo began commercial production in 2001 and in 2003 The Holiday Club (a timeshare company that offers self-catering holiday accommodation in local and international resorts), approached him enquiring about farm visits for tourists. Elias Sithole (left) and Christo Venter with the old-fashioned cheese press that is still used on the farm. 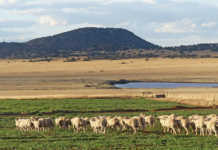 Christo now milks 120 ewes, has an on-farm restaurant and a facility where visitors can view cheese making, and supplies cheese to outlets countrywide. He milks Saanen, Toggenburg and British Alpine goats, and says he acquired all three breeds so that tourists could see that there are various milk goat breeds. The opportunity to experience farm life is also a major drawcard for city dwellers. Goat’s milk is not well known in South Africa, therefore producers who host tourists on their farms help to promote the milk’s health benefits, he explains. People also feel confident to ask questions and taste the various products here, unlike at a flea market, for example. 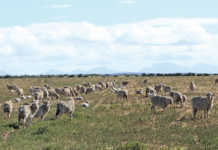 Christo believes in milking from the veld and says that his goats are well-adapted to the Waterberg’s sourveld, despite being browsers. He rotates them between several grazing camps of 3ha and 4ha in size. Between veld, some bush, green feed and protein pellets, Christo has a stocking rate of between 3SSU/ha and 5SSU/ha. It is essential, he says, that breeding animals can handle stress; goats that are fed solely from pasture would not survive under the conditions on his farm. He concedes, however, that “to milk profitably, one has to have some green feed”. To this end, he recently planted Russian grass, a subspecies of Phalaris arundinacea (reed canary grass) and P. aquatica, and says that goats eat it readily in winter, although they shun it in summer. Although Russian grass does not establish well in the bushveld during summer, as soil temperatures are too high, it does do well during bushveld winters, according to Christo. Green feed given to pregnant ewes also helps improve the health of the kids. He grows green fed on-farm, as it is not cost-effective to buy it in. All age groups receive the same feed, and the entire herd grazes Russian grass for an hour every day before being returned to the veld. All animals also receive 2kg protein pellets per day, with 1kg/animal given when they are milked in the mornings and evenings. Christo uses an Alfa Laval 12- point milk machine and plays music to the ewes while they are being milked. All the ewes on the farm are currently in-lamb, and are not milked for two months before giving birth to enable them to produce colostrum. The herd has a 20% ewe replacement rate. One ram is used on 30 ewes, and rams are placed with ewes in March, with kidding taking place in August. A few kids are born throughout the year, however, as some rams jump fences from as early as January. Attempts to use substitute milk for kids were unsuccessful and they now receive only goat’s milk to ensure that they are healthy. Ram kids are sold five days after birth to producers who fatten them for slaughter. To raise a kid to 14 weeks costs about R2 000 in milk consumption. Geluksfontein lies in a heartwater area, and managing the disease is crucial, Christo says. “With advanced heartwater, you struggle to pull an animal through. I try to manage the disease by monitoring animals’ temperature and injecting them with oxytetracycline for fever if needed. In a flock of 100 kids, I may lose about three a year, without having to administer inoculated blood,” he says. To keep up productivity, vaccination and deworming programmes have to be up to date, while animals suffering from anaemia have compromised immunity. To this end, worm counts in dung are monitored on a monthly basis. Christo also plays Afrikaans country music to his ewes while they are milked. “It relaxes them,” he says. The goats produce on average about 2,8l of milk per day, while some produce up to 5l/ day. Younger goats produce about 1,7l/ day. Approximately 10l of milk are used to produce 1kg of cheese. If enough milk is available, cheese is made daily. Milk can be stored for up to three days before being used, but thereafter quality starts deteriorating. “The idea which the older generation had that cheese can be made from lesser quality milk is outdated. You need A-grade milk to produce A-grade cheese,” says Christo. His main focus is on producing milk. “Cheese is a value-add, and is a long-term, expensive commitment. Milk provides better cash flow than cheese,” he says. There are considerably fewer allergens in goat’s milk than in cow’s milk, and international research studies have indicated that goat’s milk contains far lower levels of cholesterol. Following the correct cheese-making processes is critical, however; this includes adjusting the temperature accurately and maintaining the correct pH of the curd. Geluksfontein produces cheesecake, halloumi, feta, cheddar, semi-hard cheeses, soft maas rolls, garlic pepper rolls, as well as Bokke-Naters and Moerse-Naters (a reference to goat testicles), which are maas balls in oil. “A person never forgets that name,” Christo chuckles. He is steadily expanding the product range. Most of the sales are made directly from the farm, but Geluksfontein also supplies stores in Johannesburg and Pretoria. As cow’s milk cheese has dominated the South African market for many years, it is important to produce good quality goat’s milk cheese. Producers have to give their best, otherwise the entire market suffers, Christo says. Geluksfontein has won numerous awards for its cheese at the annual World Cheese Awards held in the UK, which attracts thousands of entries. These include a silver award for goat’s milk cheddar in 2007, silver for feta in 2006, and bronze for goat’s milk cheese rolls in 2007. The farm also received bronze and silver awards in 2005 and 2004 respectively. In addition, Christo has received accolades at numerous local cheese competitions. Phone Christo Venter on 083 704 4229, visit geluksfontein.co.za, or email [email protected].